Google Maps has made a series of updates during the first two months of the year. Most of the updates are relating to a new navigation bar. The bar consists of three icons: Places, Transit, and Driving, which help you explore the area around you. 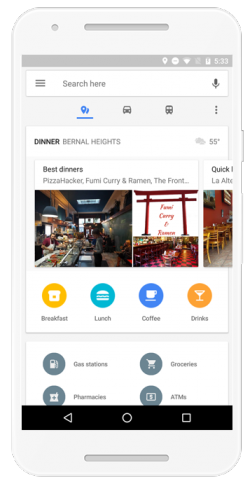 In case you missed what’s new with Google Maps, we’ve gathered the top hacks for you here. One of the keys to a successful date is to be one step ahead. Google Maps now gives you “live” updates, which will let you know exactly how busy a place is when you want to go there. To find live updates you type in and select your desired location, then tap on the name of the place and scroll down to the bottom. Another new feature will help you find parking, or at least prepare you for how difficult it will be to find parking. Google says it’s now using historical parking data to calculate a parking difficulty score. The score is displayed in Google Maps’ directions card as Limited, Medium, or Easy. To view the parking info you enter the destination and the parking difficulty icon will appear on the directions card at the bottom of the screen. As before, Google Maps will offer you multiple ways to get to a certain destination. What’s new is if you tap the icon looking like a figure with a hand up, you’ll access available ride services. It includes Uber and Lyft, among others, with price estimates. Select your ride, tap Request in the lower right corner and you’re off. Google will even integrate your payment settings so you won’t need the Uber app installed once logged in through Google Maps. Google Maps now also provides real-time transit times to and from specified locations. According to Google, it promises you that “you’ll never have to sprint to the bus again”. The transit tab will list public transport options, along with information about when the next bus or train will arrive at a stop close to you. It also allows you to share an ETA with your friends. The new Places tab is exactly what it sounds like. If you tap it you will see a set of new icons like restaurants, bars, gas stations, pharmacies, grocery stores etc. close to you. Locate the nearest WiFi, as covered in How to make Your Phone a Wi-Fi Hotspot. Simply type in “Wi-Fi Hotspots” in the search window and you’ll see the Wi-Fi spots within reach.